Shah Rukh Khan, Salman Khan & Madhuri Dixit attend Amit Thackeray’s wedding reception. HomeMukesh and Nita AmbaniShah Rukh Khan, Salman Khan & Madhuri Dixit attend Amit Thackeray’s wedding reception. 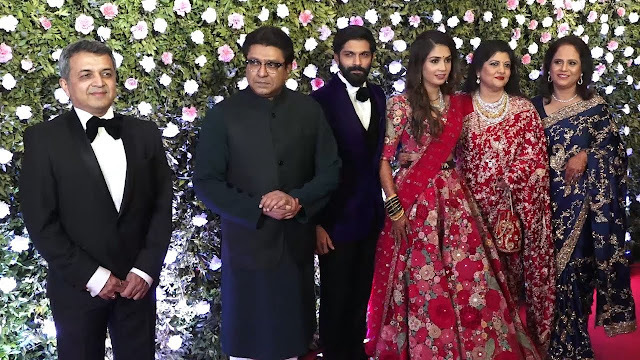 The who's who of the Hindi film industry marked their attendance at the wedding reception of Raj Thackeray's son Amit Thackeray in Mumbai. Raj Thackeray’s son Amit Thackeray tied the knot with his childhood sweetheart and fashion designer Mitali Borude in Mumbai on January 27. The wedding ceremony was followed by a grand reception in the evening. The mega event was attended by the who’s who of the Hindi film industry. Amitabh Bachchan, Jeetendra, Shah Rukh, Salman Khan, Madhuri Dixit, Farhan Akhtar, Urmila Matondkar and Rohit Shetty among others were present at the reception. Mukesh and Nita Ambani also marked their attendance at the event.